A custom jigsaw puzzle is a lasting reminder of your passion, your pet, your past-time, or your special event. Barbara will work with you to develop exactly the design you want, whether a simple three-piece puzzle for a toddler's birthday or a 75 piece wedding guest book. Your puzzle can include crystals, cut outs, stain or paint, and other unique touches. Production times vary depending on the complexity of your design and availability of materials. Simple puzzles can be designed, cut and shipped within 2 weeks, while more complicated designs require 6 to 8 weeks. All puzzles ship via USPS Priority Mail and are fully insured. The price of your puzzle will depend on the complexity of the design, the time required to draft it, the number of pieces, and your choice of woods and add-ons (crystals, stains or paints). 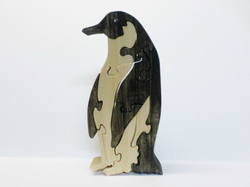 Custom hardwood puzzles of up to 10 pieces start at $29. Birch plywood puzzles of 25 or more pieces are priced at $25 plus $1.25 per piece.